A heartfelt family drama about a New York raised 12 year old child relocating to live with her conservative grandfather in Malaysia. 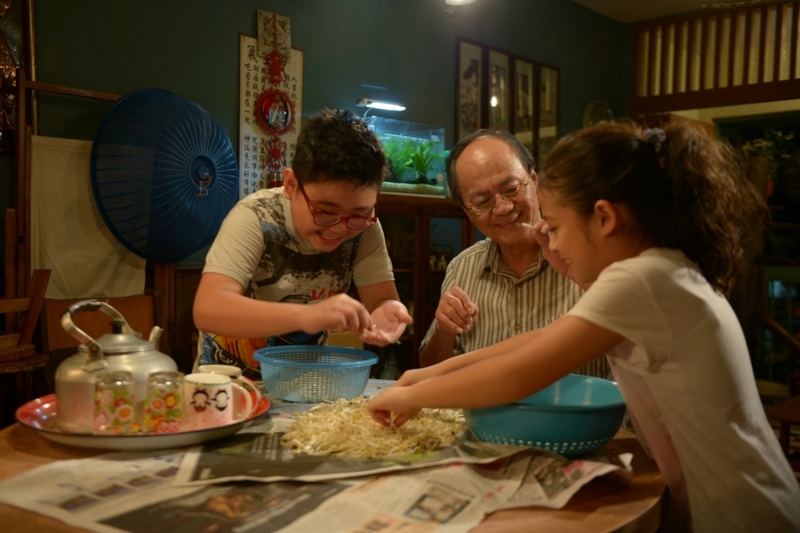 This Malaysian movie won four awards at the 7th Macau International Movie Festival in 2015, including Best Actor for Ti Lung and Best Newcomer for Tan Qin Lin. It is a charming, feel-good drama focusing on family values, colliding of culture and communications breakdown between both young and old. After it was released locally in Asian, it received two more awards at the 28th Malaysia Film Festival in 2016. 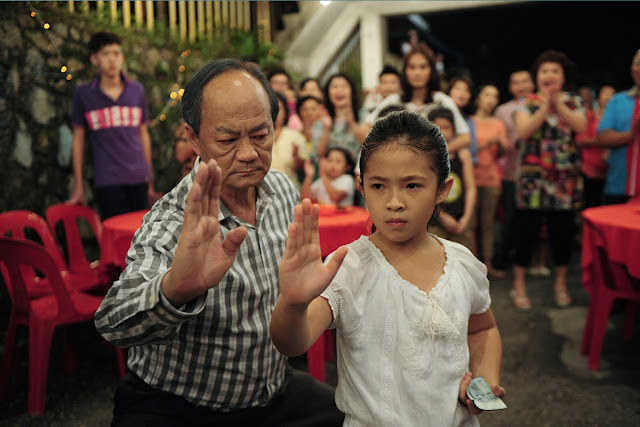 The story is about a 12 year old girl Sarah (Tan Qin Lin) from New York who has to live with her grandfather (Shaw Brothers veteran Ti Lung) in Kuala Lumpur, because of her mother’s work commitment in China. It is clear that from the moment Sarah setσ foot in her grandfather’s apartment, she has a problem adapting to her new and strange life style. Firstly, there is the language, as grandma doesn’t speak nor understand English and Sarah seems to be only communicating in English. She has trouble getting accustomed to the local Malaysian food which she hates, so she ends up eating chips that she brings with her. Moreover, she behaves like a spoiled child and looks down on her grandfather and everyone around her. As time passes, we see Sarah slowly adapting to the old Chinese traditions around her, and she even makes friends with her neighboring kids, even though they speak broken Malaysian English. Consequently, she has no choice but to communicate in Chinese, soon her relationship with grandfather improves as they slowly bond and learn to respect each other. First time director Jess Teong brings lots of charm and warmth into this heartfelt movie with a simple story set among the life of a bunch of very likeable characters. Her main concern is the gradual dissapearing of family values and traditions, on how both the younger generation and the elders adapt and communicate, living in the modern society. Despite being so young, newcomer Tan Qui Lin, who plays Sarah, is very likeable and her acting range is equally impressive. Moreover, her ability to transform from a spoiled brat to a caring child is both a delight and tear jerking at times, and will leave the viewers heartbroken. Equally good is Ah Bao, (Jayson Tan) Sarah’s new friend from next door, who is a pleasure to watch, witty and funny with his broken Malaysian English. Shaw Brothers veteran Ti Lung plays the grandfather with ease and looks the part. Through flashbacks,we learn that his relationship with his daughter Sophia (Jessica Hsuan) is actually quite a strained & unhappy affair due to both being so stubborn. None the less, we do get to see this old master flexing some muscles as he takes on some small time local gangsters who try to hustle his friendly neighbors. Although this is a Malaysian movie, the theme of family relationship and values it touches is universal and overseas viewers should be able to appreciate it, perhaps the reason why it collected a few awards both in Malaysia and overseas. To the credits of the director, this movie doesn’t feel 'overly Malaysian' even though it emphasizes local dialects and culture. This probably accounts to why we don’t see the use of typical local landmarks as backdrops in the movie. However, Malaysian viewers will still get more out of it than overseas ones. ‘The Kid from the Big Apple’ has a good story, some heartfelt moments and funny at times. The kids here are not the annoying type, besides it is so good to see Ti Lung back on the big screen again after those glory days of the Shaw Brothers. Not surprisingly, there is already a sequel in which I’m looking forward to see, since this family has become my friendly neighbors and I want to keep in touch with them.